Whilst everyone had their eyes glued to the Yeezy Season 3 show, HBO subtly dropped the first batch of official photos for season six of Game of Thrones. With season six on the horizon this is our closest look yet at what showrunners David Benioff and D.B Weiss have in store for us. 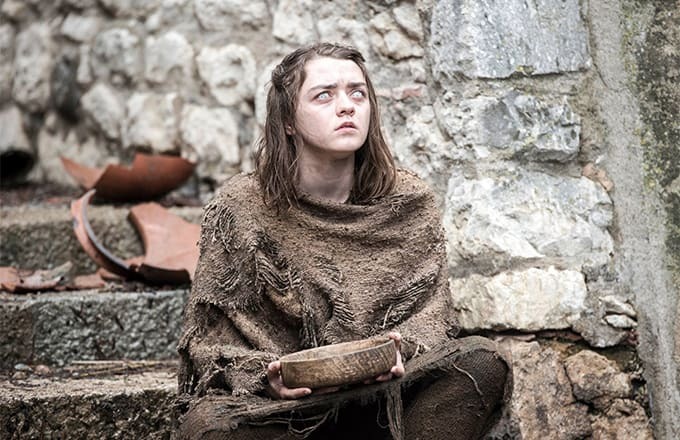 By the looks of things the situation isn’t exactly going well for everyone’s favourite would-be assassin Arya Stark, played by Masie Williams — as you may remember last season she lost her sight after performing an unsanctioned hit. As for her sister Sansa, played by Sophie Turner, it looks like her escape from Winterfell (and her psychopathic husband), with the help of Alfie Allen's Theon Greyjoy, was successful. Speaking of the Greyjoy’s, season six will also take us back to the Iron Islands as the new set of pictures also included Theon’s father and sister (remember them? ), Balon and Yara. Season six also sees the return of Brandon Stark (played by Isaac Hempstead-Wright) who was absent from the last season and now seems to be walking all of a sudden, with Max von Sydow as the Three-Eyed Raven in what appears to be Winterfell. Whilst it’s awesome we’ve got an idea of what’s to come for season six, there’s one thing that’s still missing. We have no photos of Jon Snow! Come on HBO stop playing us like this, our emotions are still fragile from last season's betrayal and all we want to know is if everyone’s favourite illegitimate son is alive or not! Season six of Game of Thrones will begin airing on HBO and Sky Atlantic on April 24th so make sure you set you alarms.